From Stephanie of Croydon, VIC (Australia) regarding the Eco Recycled Solid Timber High Bench Table in Natural + Rustic White Legs she purchased. “...Many thanks, Murray and Vikki. It was great to meet you the other day and I appreciate the personal delivery! I am so pleased with my bench table, you have done a fabulous job! It looks and feels amazing. This stunning table will always have a prime position in my home. You have managed to accentuate the character of this beautiful wood so perfectly - the finish is outstanding...” See our Eco Recycled High Bench Bar Table in White & Timber, to order yours today. From Cruise Bar of Sydney, NSW (Australia) regarding the Eco Recycled Solid Timber High Bench Bar Table in White & Timber with Matching Wooden Stools they purchased. “...Thank you very much for the wonderful tables and stools, the staff and guests are loving them and it has really enhanced the feel of the area...” See our Eco Recycled High Bench Bar Table in White & Timber, to order yours today. From Bec and Tom of Bellambi, NSW (Australia) regarding the Eco Recycled High Bench Table in White & Timber with Wheels they purchased. “...We purchased our high bench table from Ghify and could not be happier with the quality and workmanship of the furniture. We have received so many compliments and it has really tied our kitchen together. Our whole experience with the team at Ghify was wonderful, from first contact to last. Murrey and his team went above and beyond to keep us updated on our order and even arranged for the table to be home delivered and assembled in our second story kitchen. Nothing was too much trouble! We would definitely recommend Ghify and look forward to ordering from them again!...” See our Eco Recycled High Bench Table in White & Timber with Wheels, to order yours today. From Danielle and Steve of Paddington, QLD (Australia) regarding the Kitchen Island / High Bench Table in Dark Walnut + matching Shelves they purchased. “...Just wanted to say thanks again so much for our beautiful bench and shelves - they are perfect! We just love them, thank you...” See our Industrial Recycled Retro High Bench Table / Desk in Dark Walnut, to order yours today. From Judith of Hallett Cove, SA (Australia) regarding the High Bench Table / Desk in Dark Walnut she purchased. “...The table arrived this morning. It is superb, just beautiful! Beyond my expectation. I procrastinated for 2 years over the risks I perceived could occur when buying specially made bespoke furniture ‘online’. I can only say, from woe to go it has been a great experience dealing with GHIFY and staff. I will not hesitate to make orders from GHIFY in the future. Once again, many thanks for this beautiful table....” See our Industrial Recycled Retro High Bench Table / Desk in Dark Walnut, to order yours today. From Katie of Onslow, WA (Australia) regarding the Solid Timber High Bench Table / Wooden Desk in White & Timber with Wheels she purchased. “...Such an awesome table!...” See our Industrial Recycled Retro High Bench Table in White & Timber with Wheels, to order yours today. From Kylie of Milsons Point, NSW (Australia) regarding the Modern Rustic Mid Century 2m High Bench Table | Kitchen Island | Workbench she purchased. “...We received the table nice & early this morning :) Looks amazing!...” See our Modern Rustic Mid Century 2m High Bench Table | 8 Seater Kitchen Island | Workbench, to order yours today. From Nicole of Sydney, NSW (Australia) regarding the Industrial Recycled Retro Solid Timber High Bench Table with Wheels + Shelf in White Top and Black Legs she purchased. “...The table has been delivered, looks amazing! The delivery guys were lovely as well! Thanks again for all of your help, it is very much appreciated. I will definitely recommend you to anyone! Was super easy to assemble! The kids are very excited as well as me! Having a glass of bubbles to celebrate!...” See our Custom Industrial Recycled Retro Solid Timber High Bench Table with Wheels + Shelf in White Top and Black Legs, to order yours today. From Lauri of Westminster, WA (Australia) regarding the Industrial Recycled Retro Solid Timber Top High Bench Bar Table in Dark Walnut she purchased. “...The team at GHIFY were such a pleasure to deal with. Our table was even more beautiful than we expected (my hubby says it reveals more of itself each day haha) and if it wasn't for their amazing customer service we never would've found chairs to go with it as we'd been looking and looking and just couldn't find anything until they sent through a list of recommendations based on what we were looking for - they totally went above and beyond. Sorry its taken so long to write this but thanks so much again for everything, GHIFY!...” See our Industrial Recycled Retro High Bench Table / Desk in Dark Walnut, to order yours today. From Harley Augustine, Executive Director, Strategy Future Brand Australia: “...she just arrived and she's BEAUTIFUL! Love it... Thank you so much - it's been an absolute pleasure from start to finish and the work is nothing short of exceptional...” See our Industrial Recycled Modern Laser Engraved Branded High Bench Dining Table & Kitchen Island in Natural with White Hairpin Legs, to order yours today. From Michele of London regarding the High Bench Table / Desk in Dark Walnut Unit she purchased. “...I am in the UK and looked all over the internet to find the exact workbench and the exact colour scheme I needed. This is how I came across Ghify. Their site had great photos, they offered both the required customisation and seemed willing to do business anywhere… Still … Australia ? Well, I dared … and I never looked back. Ghify delivered exceptional goods and exceptional service – the funniest part of it was trying to discuss the exact shade of blue by email. Even then… they are resourceful and we ended up matching Dulux colour cards via email! It all worked out, perfectly – including shipment. I could not be happier! And they are very nice people to buy from...” See our Industrial Recycled Retro High Bench Table / Desk in Dark Walnut, to order yours today. From Lisa of Sorell, TAS (Australia) regarding the Industrial Recycled Retro Wooden Island Bench Table in White she purchased. “...I am so in love with my table, it arrived safely yesterday.. Thank you so much, it is absolutely amazing… Thank you for the exceptional customer service also...” See our Industrial Recycled Retro Island Bench Table in White, to order yours today. From Kate of Elwood, VIC (Australia) regarding the Industrial Recycled Solid Timber Kitchen Island / Wooden High Bench Table in White Painted Base and Polished Top with Adjusters she purchased. “...I've been meaning to drop you a note ever since the bench arrived to tell how how extremely happy we are with it. It's beautiful and it works perfectly in the space/against the existing bench, which I find extraordinary as you've managed to achieve this from all the way up in Queensland. I'll review it on Etsy too of course, but just wanted to let you know we're thrilled. Thank you so much...” See our Custom Handmade Rustic Industrial Recycled Retro Solid Timber Kitchen Islands / Wooden High Bench Tables collection, to order yours today. From Annie of Henley Beach, SA (Australia) regarding the Industrial Recycled Retro Wooden Island Bench Table in White she purchased. “...products just really nice :) everyone just loves them, it is definitely worth to wait. Again, thank you very much for the beautiful products. Much appreciated!...” See our Industrial Recycled Retro Solid Timber Island Bench Table in White, to order yours today. From Todd of Mooloolaba, QLD (Australia) regarding the Eco Recycled Solid Timber High Bench Tables in the Walnut Finish with Lockable Castor Wheels he purchased. “...Sorry for the delay in touching base since our high top tables have arrived.. I just wanted to say thanks for a fantastic job. Great quality & workmanship. We are so happy with them :) ...” See our Industrial Recycled Retro Solid Timber High Bench Table / Wooden Desk in Dark Walnut Finish, to order yours today. From Jane of ROSELANDS, NSW (Australia) regarding the Retro Recycled Country Farmhouse High Bench Table in Natural with Wheels she purchased. “...Just got home and the kitchen island was here. Just wanted to say a massive thanks for getting it to us on time, we've got 20 people coming over this weekend so going to come in handy. Other half loves it, he said "best present ever" thank you!!! !...” See our Retro Recycled Country Farmhouse High Bench Table in Natural with Wheels, to order yours today. From Sarah of Hawthorn, VIC (Australia) regarding the French Chic 1960s Off-White Solid Timber Armchair + Free Matching Cushion she purchased. “...I bought two of the French Chic Provincial 1960's Hamptons Solid Timber Handmade Wooden Armchairs in Light Cream Off-White Upholstery from Ghify. Their Customer Service was outstanding. They responded quickly and helpfully to emails and always kept me informed on what was happening with my order every step of the way. The chairs themselves are perfect for what I wanted. Very well made, sturdy and comfortable. I highly recommend Ghify and their products...” See our French Chic 1960s Off-White Armchair, to order yours today. From Josh of Mount Cotton, QLD (Australia) regarding the Industrial Recycled Retro High Bench Table in Natural (SUPERSIZED) + Eco-Friendly Handmade Recycled Chairs / Bar Stools in Natural with light wax applied he purchased. “...Fits in brilliant mate, thanks very much...” See our Industrial Recycled Retro High Bench Table in Natural with Wheels (SUPERSIZED), to order yours today. From Sonja of Caboolture South, QLD (Australia) regarding the French Chic 1960s Off-White Wooden Armchair + Free Matching Cushion she purchased. “...Thank you so much love love the chair. Great doing business with you...” See our French Chic 1960s Off-White Solid Timber Armchair, to order yours today. From Kate of Teneriffe, QLD (Australia) regarding the Industrial Recycled Retro High Bench Table in White & Timber with Wheels she purchased. “...I love my table, it looks great...” See our Industrial Recycled Retro High Bench Table in White & Timber with Wheels, to order yours today. From Brad of Gordon, NSW (Australia) regarding the Industrial Recycled Retro Wooden High Bench Table in White & Timber with Drawers & Shelves he purchased. “...Wow! Wow! Wow! That is absolutely amazing! it looks like something out of a designer magazine! So so beautiful...” See our Industrial Recycled Retro High Bench Table in White & Timber with Drawers & Shelves, to order yours today. From Matias of Alexandria, NSW (Australia) regarding the Custom Handmade Rustic Solid Timber Petite High Bench Table / Wooden Desk in Natural & White he purchased. “...Thanks, I got the email this morning and it’s beautiful. Very happy with it :)...” See our Retro Recycled Country Farmhouse "Petite" High Bench Table / Desk in Natural & White, to order yours today. From David of Sandringham, VIC (Australia) regarding the Custom Handmade Rustic Solid Timber Redgum Recycled High Bench Table / Wooden Kitchen Island he purchased. “...Thanks for the table. It arrived on Friday and looks fantastic - a true work of art. Here's a photo of it in place. Thanks again, truly wonderful craftsmanship...” See our Custom Handmade Rustic Industrial Recycled Retro Solid Timber High Bench Tables / Wooden Kitchen Islands, Desks Collection, to order yours today. From David of Albert Park, VIC (Australia) regarding the SUPERSIZED Industrial Recycled Retro Wooden High Bench Table in White & Natural he purchased. “...The table looks great...” See our Industrial Recycled Retro Solid Timber High Bench Table in White & Natural (SUPERSIZED), to order yours today. From Lee & Steve of Barooga, NSW (Australia) regarding the Recycled Teak Large Sideboard - 6 Doors + 3 Drawers they purchased. “...Hi Will our beautiful dresser has arrived safe and sound by a really nice driver mark it arrived last night about 7.30 and our neighbours took delivery because we were out it is just stunning and you were right the photos don't do it justice at all we are so thrilled with it it is beautifully made you have been so nice and to helpful to us over this whole process it's so great to deal with lovely people we wish you all the best in the future and will spread the word that's the best marketing that money can't buy regards lee and Steve...” See our Recycled Teak Large Sideboard - 6 Doors + 3 Drawers, to order yours today. From Penny of Sydney, NSW (Australia) regarding the Industrial Recycled Retro SUPERSIZED Wooden High Bench Table in Dark Walnut Finish she purchased. “...Hey Will I know you have and super appreciative of all your efforts...” See our Industrial Recycled Retro Solid Timber High Bench Table in Dark Walnut Finish (SUPERSIZED), to order yours today. From Danica of Sydney, NSW (Australia) regarding the Modern Danish Wooden Dining Suite she purchased. “...Thank you for the outstanding service from day one. I finally unpacked the dining table and chairs (super impressed with how they were packaged!) and I absolutely LOVE the dining suite! It exceeded my expectations entirely...” See our Modern Danish Wooden Dining Suite | Round Angle Dining Table + Scoop Dining Chairs, to order yours today. From Chirag of Meadowbank, NSW (Australia) regarding the Custom Made Solid Timber Entertainment Unit he purchased. “...Thank you very much...! Love it!!! Please let me know if there is anywhere I can leave a positive review for your product and your amazing service. We ordered a custom made entertainment unit from GHIFY…. We love it… It’s an awesome piece of furniture made with love and it adds so much to our apartment. Will is extremely easy to deal with. He is very helpful and gives the right kind of suggestions. He knows his stuff. I would recommend GHIFY and Will to everyone. Will’s staff Jude was also very helpful and quick to respond to all our queries regrading delivery of the unit. Loved the experience of shopping with GHIFY and we will definitely be shopping with them soon!! !...” See our Modern Entertainment Units / Long TV / Media / Small AV Units collection, to order yours today. From Katrina and Allan of Perth, WA (Australia) regarding the Industrial Recycled Retro Solid Timber Island Bench Table in White they purchased. “...I just wanted to tell you how happy we are with the beautiful table you sent us. We absolutely love it, it is exactly what we asked for and is so well made. I thought you might like to see it in situ…. Your service and communication throughout the process was brilliant...” See our Industrial Recycled Retro Solid Timber Island Bench Table in White, to order yours today. From Karen of Sydney, NSW (Australia) regarding the Modern Danish Wooden Dining Suite she purchased. “...I didn't get a chance until today. I have just unpacked the items and assembled it. Congratulation to your company because you guys have done a brilliant job. The items were well packed. The quality of the products are consistent with the photos posted on the website. Even the courier contacted me on the same day for the delivery, but he rang me in the early morning, and delivered in the evening. That's what I want to happen. I am always so worried about the delivery because of my bad experiences in the past. I am glad I have an opportunity to do a business with you and your company. I have been promoting your company's website to a few of my colleagues, I hope they can find what they like too. : )...” See our Modern Danish Wooden Dining Suite, to order yours today. From Vicki of East Doncaster, VIC (Australia) regarding the Modern Danish Large Angle Rectangle Wooden Dining Table / Desk she purchased. “...I have finally managed to get the table together, sorry it took this long but I had to wait For a friend to help me lift it. ITS FANTASTIC! I love it thank you it was worth the wait...” See our Modern Danish Large Angle Rectangle Wooden Dining Table / Desk, to order yours today. From Hannah of West Perth, WA (Australia) regarding the Wooden Solid Tops Rustic Tables she purchased. “...Just letting you know we have just put the tables together and they are looking fabulous! Everyone is crazy about them! Thank you so much for all your help with this. The level of customer service and the final product have far exceeded my expectations and I can’t thank you enough!...” See our Industrial Recycled Retro Solid Timber Rustic Dining Tables / Desks, to order yours today. From Lynne of Tweed Heads, NSW (Australia) regarding the Industrial Recycled Retro High Bench Table in Natural they purchased. “...A few pics of your beautiful table in our little store...” See our Industrial Recycled Retro High Bench Table in Natural, to order yours today. From Sarah of Hampton, VIC (Australia) regarding the Assorted Retro Modern Mid Century Eco Recycled Wooden Modular Bookcase / Bench / TV Stand she purchased. “...They arrived yesterday I think but we only unwrapped them today. We love them so much! They are for our son's, (also called Will), bedroom. He is nearly five and it's his first ever bedroom of his own. You have no idea how happy he is. They've created a bookcase/dinosaur corner which he is now sitting back admiring...” See our Retro Modern Mid Century Eco Recycled Solid Timber Modular Bookcase / Bench / TV Stand, to order yours today. From Miso of South Yarr, VIC (Australia) regarding the Industrial Recycled Retro Wooden High Bench Table in White & Natural (SUPERSIZED) she purchased. “...Amazing service and can't wait to see the table!...” See our Industrial Recycled Retro Solid Timber High Bench Table in White & Natural (SUPERSIZED), to order yours today. From Brenda of Bayswater, WA (Australia) regarding the Modern Danish Wooden Large Angle Rectangle Dining Table / Desk she purchased. “...Thank you again - you have been fantastic to liaise with and all of your help has been really exceptional. I will definitely be leaving positive feedback on your site...” See our Modern Danish Large Angle Rectangle Dining Table / Desk, to order yours today. From Michelle of Burradoo, NSW (Australia) regarding the Industrial Recycled Retro Island Bench Table in White she purchased. “...It has arrived, it is great, thanks so much!! :)...” See our Industrial Recycled Retro Island Bench Table in White, to order yours today. From Siobhan of Morningside, QLD (Australia) regarding the Modern Danish Wooden 1 Door Entertainment Unit (Small) she purchased. “...Thank you all for your great service - I got the entertainment unit just after I read your email yesterday and I love it! The quality and look of the unit exceeded my expectations so I'll definitely be singing your praises and leaving positive feedback for others to review. It's been a real pleasure dealing with Ghify and I hope to be back if I need another beautiful piece for my home. :D...” See our Modern Danish 1 Door Entertainment Unit (Small), to order yours today. From Glenda of Boyup Brook, WA (Australia) regarding the Retro Recycled Country Farmhouse Solid Timber High Bench Table / Wooden Kitchen Island in Natural with Wheels she purchased. “...wow, its great, unpacked it yesterday...” See our Retro Recycled Country Farmhouse High Bench Table in Natural with Wheels, to order yours today. From Fiona of Nedlands, WA (Australia) regarding the Industrial Recycled Retro Wooden High Bench Table in Natural she purchased. “...Got it, thanks everyone. It looks fantastic!...” See our Industrial Recycled Retro Solid Timber High Bench Table in Natural, to order yours today. From Romney of Caulfield South, VIC (Australia) regarding the Recycled Teak Medium Desk or Wooden Dining Table he purchased. “...Just thought I'd send you a photo of the table all set up - we are thrilled! Thanks so much for your help to set it up last night...” See our Recycled Teak Medium Desk or Dining Table, to order yours today. From Terry of Wollstonecraft, NSW (Australia) regarding the Modern Danish 2 Door Large Entertainment Unit he purchased. “...The entertainment unit arrived late yesterday afternoon. I was very impressed at how it was boxed up. My son was helping me unbox it and said it was like playing pass-the-parcel! Thanks for everything. The unit looks great and is exactly what I was after. I have been very impressed with the customer service...” See our Modern Danish Wooden 2 Door Entertainment Unit (Large), to order yours today. From Helen of Belmont, VIC (Australia) regarding the Modern Danish Wooden Bar Stools she purchased. “...thank you so much your courteous service. We appreciated you keeping us in the loop as to purchase and delivery of our stools. Absolutely love them - simplistic lines and comfortable to sit on. You are to be commended both for beautiful furniture at affordable prices. Service and packaging were exemplary - just love our stools... unwrapping reminded me of Christmas morning as a child - anticipation and delight. Cheers...” See our Modern Danish Solid Timber Bar Stool, to order yours today. From Adie of Stafford, QLD (Australia) regarding the Modern Danish Medium Sideboard she purchased. “...Thank you very much for the cheese cutting sets you put in with the sideboard, they are lovely. We are really happy with the sideboard, it looks great in our living room...” See our Modern Danish Medium Sideboard, to order yours today. From Margaret of Coburg, VIC (Australia) regarding the Shabby Chic Rectangle Mirror - French Vanilla she purchased. “...I have just received a mirror which I ordered from you via Etsy. I am so pleased with it; it is exactly what I wanted. Thank you very much...” See our Shabby Chic Rectangle Mirror - French Vanilla, to order yours today. From Helen of Glebe, NSW (Australia) regarding the Recycled Teak Large Sideboard - 6 Doors + 3 Drawers she purchased. “...Absolutely love our sideboard. Delivery was a breeze and it looks perfect. Thank you so much and I'll be recommending you to all our friends...” See our Recycled Teak Large Sideboard - 6 Doors + 3 Drawers, to order yours today. From Genevieve of West End, QLD (Australia) regarding the Solid Timber High Bench Table / Wooden Desk in Dark Walnut she purchased. “...Thank you so much. It is just beautiful and I can't help running my hands across the table top. I look forward to the girls and I having our first dinner there!...” See our Industrial Recycled Retro High Bench Table / Desk in Dark Walnut, to order yours today. From Scott of Victoria Point, QLD (Australia) regarding the 2 Door Entertainment Unit he purchased. “...Just wanted to say thanks for the great service and for getting the entertainment unit delivered today. So greatly appreciated. It fits perfectly and is a great piece. I will be back online again soon to purchase some more pieces and possibly for a custom quote for a sideboard. Thanks again for your service and assistance...” See our Modern Danish 2 Door Entertainment Unit (Large), to order yours today. From Lisa of Willoughby East, NSW (Australia) regarding the Recycled Teak Wooden Coffee Table she purchased. “...Table arrived! Love it...” See our Recycled Teak Solid Timber Coffee Table, to order yours today. From Pauline of Maylands, WA (Australia) regarding the Modern Danish Wooden 1 Door Small Entertainment Unit she purchased. “...The cabinet arrived this morning. Very speedy! I love it and will be sure to recommend to others...” See our Modern Danish Wooden 1 Door Entertainment Unit (Small), to order yours today. From Ursula of Carina, QLD (Australia) regarding the Industrial Recycled Retro Wooden Island Bench Table in White she purchased. “...Looks great!! I think it will be very happy living at my house!...” See our Industrial Recycled Retro Solid Timber Island Bench Table in White, to order yours today. From Andrew of Kensington, WA (Australia) regarding the Once Upon A Queenslander Solid Timber Furniture he purchased. “...We LOVE the furniture mate! It is everything we wanted and more. It has really finished off our area upstairs. We'll be back in touch somewhere down the track when we are ready to start downstairs but until then thanks for your magic touch on producing such wonderful furniture for our home. It is everything we wanted and more!...” See our entire range of Eco Recycled Wooden Furniture, to order yours today. From Sally of Bourke, NSW (Australia) regarding the Solid Timber Petite High Bench Table / Wooden Desk in Natural & White she purchased. “...Just letting you know the table arrived in Bourke safely and we picked it up yesterday. Absolutely love it! Thanks very much for your service...” See our Retro Recycled Country Farmhouse Petite High Bench Table / Desk in Natural & White, to order yours today. From Bobby of Palmwoods, NSW (Australia) regarding the Modern Danish Wooden Modular Bookshelves he purchased. “...All arrived safely thanks, they are beautiful...” See our Modern Danish Solid Timber Modular Bookshelf, to order yours today. From Vernon of Ellenbrook, WA (Australia) regarding the Modern Danish X-LARGE 2.4m Angle Rectangle Wooden Dining Table he purchased. “...GHIFY does indeed provide exceptional customer service above and beyond what we have expected. We will definitely return to purchase more and recommend GHIFY to our friends. Thank you so much for your help and for the replies to my questions, this is really great customer service...” See our Modern Danish X-LARGE (2.4m!) Angle Rectangle Dining Table / Desk, to order yours today. From Rowena of Holland Park West, QLD (Australia) regarding the Industrial Recycled Retro Wooden Island Bench Table in White she purchased. “...Will it's perfect we completely love it. It is without doubt the best piece for that particular space. I had high expectations and you absolutely delivered. Thank you for your perfectionism and providing us with a very functional yet beautiful piece of furniture that will be treasured...” See our Industrial Recycled Retro Solid Timber Island Bench Table in White, to order yours today. From Christian of Norwood, SA (Australia) regarding the Solid Timber Petite High Bench Table / Wooden Desk in Natural & White he purchased. “...Just a note to say that the bench I ordered is perfect!...” See our Retro Recycled Country Farmhouse Petite High Bench Table / Desk in Natural & White, to order yours today. From Cathy and Craig of Somerton, VIC (Australia) regarding the Shabby Chic Painted Wine Rack in Mint they purchased. “...Thanks for the wine rack. It arrived very well packed, took us a bottle to unwrap. And as you can see it fits perfectly...” See our Shabby Chic Painted Wine Rack in Mint with Built-In Drawer, to order yours today. From Jane of West Leederville, WA (Australia) regarding the Modern Danish Long Entertainment Unit she purchased. “...Thanks - I checked this morning and it was on board for delivery and it has just been delivered. The box is impressive. Will open and check it later today. I’m very excited about this new way of shopping, makes living in Perth a little bit easier now we have the choice of the best from around Australia...” See our Modern Danish Long Entertainment Unit, to order yours today. From Kym of Berserker, QLD (Australia) regarding the Modern Danish Furniture she purchased. “...We have unpacked and set up our reception area with the new furniture over the weekend. We are thrilled! Thank you so much for the beautiful furniture and your excellent service...” See our Modern Danish Furniture, to order yours today. From Shauna of Baldivis, WA (Australia) regarding the Modern Danish Furniture she purchased. “...Thank you (and your team at GHIFY) for your amazing follow up communication in regards to the delivery, especially so without even being asked by myself. You guys continue to amaze me with your prompt responses and fantastic customer service! Chair is in place finally - Beautifully made - I love it! My dealings with you and your staff, before, during and after delivery, have been of the utmost professional nature and done so with such a courteous manner too - something that is becoming rare these days indeed. Thank you so much once again - I couldn’t recommend you all higher enough to all that ask!...” See our Modern Danish Furniture, to order yours today. From Kathryn of Middlemount, QLD (Australia) regarding the Modern Danish Modular Bookshelf she purchased. “...It came yesterday afternoon. Thanks so much for all your help. The bookshelf is perfect!..” See our Modern Danish Modular Bookshelf, to order yours today. From Ann of Goulburn, NSW (Australia) regarding the Modern Danish Oval Coffee Table she purchased. "...It arrived safely today. Many many thanks! Perfect in our retro living room. Love it!..." See our Modern Danish Oval Coffee Table, to order yours today. From Anjanette of Clovelly, NSW (Australia) regarding the Modern Danish Round Angle Dining Table she purchased. “...Just to let you know our beautiful table arrived yesterday in perfect condition. The packaging was incredibly protective! Thank you so much for all of your help and attention - we will definitely have no hesitation in buying from you again in the future! All the best!...” See our Modern Danish Round Angle Dining Table, to order yours today. From Agnes of East Ballina, NSW (Australia) regarding the Modern Danish Desk With Drawers she purchased. “...Thank you very much for this update regarding my pretty purchase of a GHIFY desk. I have always wanted a feminine set up for writing,and here, at last, I am about to have one! My study is now cleared of 'stuff' so that it will be as elegant as can be and free from distraction, so that I can delve into the wonderful world of my imagination, the extent of which I am yet to discover!! I can see how all the folk at GHIFY are 'happy elves' being involved in such a delightful enterprise. My intention now is to save up for one of your gorgeous dining tables and matching chairs, so I will definitely be keeping a close eye on updates and exclusive offers...” See our Modern Danish Desk With Drawers, to order yours today. From Tracey of Erskineville, NSW (Australia) regarding the Modern Danish 2 Door Entertainment Unit she purchased. “...Just wanted to let you know that we finally set up the entertainment unit on Sunday. It looks great and everything fits perfectly inside. No doubt I will be looking at some more items from you very soon once we decide what extra pieces we want in our lounge room...” See our Modern Danish 2 Door Entertainment Unit, to order yours today. From Trevor of Bondi Beach, NSW (Australia) regarding the Recycled Teak Furniture he purchased. “...The bedside tables and side board arrived and we are happy with our purchase...” See our Recycled Teak Furniture, to order yours today. From Michael of Killarney Heights, NSW (Australia) regarding the Modern Danish Long Entertainment Unit he purchased. “...Goods received yesterday. Thanks so much for your assistance on this. Unit is great and we are extremely happy with the result...” See our Modern Danish Long Entertainment Unit, to order yours today. From Fiona of Kurrajong, NSW (Australia) regarding the Modern Danish Angle Dining Chair she purchased. “...Thank you very much! The chair arrived on Friday and it is beautiful!...” See our Modern Danish Angle Dining Chair, to order yours today. From Suzanne of Nunawading, VIC (Australia) regarding the Modern Danish Large Sideboard she purchased. “...I am really looking forward to getting my order as I recently purchased a TV Unit from Ghify and I was really impressed with the quality of the Unit and the packaging. Initially I was concerned as to whether there would be any damage during transit, but the packaging was just fantastic. I absolutely LOVE my beautiful TV Unit and can't wait for this order to be delivered...” See our Modern Danish Large Sideboard, to order yours today. From Linda of Capalaba, QLD (Australia) regarding the Modern Cottage Hall Table she purchased. “...Just wanted to let you know that the Hall Table looks fabulous and was the perfect fit for where I wanted it. I look forward to decorating my home with more of your beautiful furniture in the future..."
From Esther of Newcastle West, NSW (Australia) regarding the Modern Danish Large Angle Rectangle Dining Table she purchased. “...Thanks for the amazing customer service! It’s been a long time since I have received such warm and responsive treatment...” See our Modern Danish Large Angle Rectangle Dining Table, to order yours today. From Mari of Newport, NSW (Australia) regarding the Modern Danish Bedside Tables she purchased. “...Thank you so much!!! I really appreciate it, I made my purchase this morning and I can’t wait for them to arrive. Also thank you for your quick reply, your customer service is amazing!...” See our Modern Danish Bedside Tables, to order yours today. From Alan of Allambie Heights of NSW (Australia) regarding the Eco Recycled High Bench Table he purchased. "...The bench is fantastic! Thank you!...” See our Eco Recycled High Bench Table, to order yours today. From Emma of Glenalta, South Australia regarding the Modern Danish Long Entertainment Unit she purchased. “...Our TV unit arrived yesterday. We are very happy with it, its such great quality & looks perfect in our lounge room. Very happy we found your website...” See our Modern Danish Long Entertainment Unit, to order your today. From John of Belmont, NSW (Australia) regarding the SoHo High Bar Stool he purchased. "...Just to let you know how pleased I am with the stool you sent me, it is great. Delivery was very fast and the packaging was incredible. All perfect, thank you..."
From Leisa of Mount Pleasant of QLD (Australia) regarding the Eco Recycled High Bench Table she purchased. "...It’s like getting used to a new person around – it’s different to other tables because it’s unique and has character. It makes me feel good just to see something so nice there. People comment on it when they see it. Great dealing with you – I will definitely recommend you to others! Thanks for being so ‘with-it’ - you kept in contact throughout the process and couldn't be more helpful. I will definitely be recommending you to others (I have already, a number of times)..." See our Eco Recycled High Bench Table, to order yours today. From Michael of Gordon, NSW (Australia) regarding the Modern Danish Bar Stools he purchased. “...Just wanted to say, outstanding work, they were delivered on Tuesday, great packing!..." See our Modern Danish Bar Stools, to order yours today. From Justine of Yamba, NSW (Australia) regarding the Modern Danish Long Entertainment Unit she purchased. "...Thanks so much, great service!..." See our Modern Danish Long Entertainment Unit, to order yours today. From Melinda of Willow Vale, QLD (Australia) regarding the French Chic 1960s French Provincial Console she purchased. "...Thank you so much! I love my new table! It is just lovely - the delivery was quick and I am very impressed with the service..." See our French Chic 1960's French Provincial Console, to order yours today. From Sharyne of Newport, NSW (Australia) regarding the Modern Danish Bedside Table she purchased. “...Thank-you! My client is very happy with the bedside table!...” See our Modern Danish Bedside Table, to order yours today. From Claire of Quindalup, WA (Austalia) regarding the Modern Danish Oval Coffee Table she purchased. "...We love our coffee table..." See our Modern Danish Oval Coffee Table, to order yours today. From Marlies of Denistone West, NSW (Australia) regarding the Modern Danish Open Entertainment Unit she purchased. “...Thank you so much! It was sitting at the front door when I arrived home. What a nice surprise. Very happy. Well packed, easy! Thank you for an easy transaction. Best regards...” See our Modern Danish Open Entertainment Unit, to order yours today. From Karyn of Erskine Park, NSW (Australia) regarding the Modern Danish Spindle Dining Chair she purchased. “...Thank you! The chair arrived yesterday and we are very pleased!...” See our Modern Danish Spindle Dining Chair, to order yours today. From Lucy & Matt of New South Wales (Australia) regarding the Eco Recycled High Bench Table in White they purchased. "...Thank you Maddy and Will for our amazing new table. Your customer service was fantastic and we couldn't believe how quickly our beautiful table arrived! It looks perfect in our new kitchen. Wishing you all the best, keep up the good work! Lucy & Matt..." See our Eco Recycled High Bench Table in White, to order yours today. From Adam & Nicole of Fairy Meadow, NSW (Australia) regarding their custom made order of the 'Once Upon A Queenslander' Eco Recycled High Bench Table in Natural they purchased. "...Just wanted to say a big thank you for all the amazing communication throughout the whole process and obviously for such an amazing table to have great conversations at..." See our 'Once Upon A Queenslander' Eco Recycle High Bench Table in Natural, to order yours today. From Stephanie of Jan Juc, Victoria regarding the "Once Upon A Queenslander" Eco Recycled Sideboard / Entertainment Unit in Denim they purchased. “...Thanks guys, we have our sideboard and we LOVE it!..." See our "Once Upon A Queenslander" Eco Recycled Sideboard / Entertainment Unit in Denim, to order yours today. From Vanessa of Chadstone, VIC (Australia) regarding the Modern Danish Furniture he purchased. "...I've unpacked the TV unit, all 6 layers and I love it!..." See our Modern Danish Furniture, to order yours today. From Jeremy & Kate of Brunswick East, VIC (Australia) regarding the Modern Danish Modular Bookshelves they purchased. “...We bought 4 bookshelves from you last month. I’m just clearing out old emails and wanted to let you know that we LOVE the bookshelves. Our friends admire them too and we tell them we bought them from GHIFY...” See our Modern Danish Modular Bookshelves, to order your today. From Emma Cooper of Feilding, New Zealand, regarding the Yellow Dog Painting she purchased. “...Just a quick email to let you know that your Yellow Dog picture was delivered safe and sound to us last week. It was beautifully packaged and the freight time to New Zealand was only 4 days, which is pretty impressive. We all love the painting and it fits right into our home as though we have always owned it. I fell in love with this picture the moment I saw it. You run a great business Maddy. Thank you for all your help and time. All the best..." See our Yellow Dog Painting, to order your today. From Olde from Froebel Australia of Sydney, NSW (Australia) regarding the Modern Danish Large Angle Rectangle Dining Table he purchased. “...You've won a couple of new fans here in Sydney!...” See our Modern Danish Large Angle Rectangle Dining Table, to order yours today. From Emma of Coffs Harbour, NSW (Australia) regarding the Modern Danish Bar Stools she purchased. "...You guys rock! Amazing packaging, even the delivery guy reckons the best he has ever seen! Thanks guys, perfect stools. They look awesome. Very happy, Cheers..." See our Modern Danish Bar Stools, to order yours today. From Shalom of Sydney, NSW (Australia) regarding the Modern Danish Long Entertainment Unit he purchased. “...Just to let you know, the entertainment unit arrived safely on Christmas Eve. Thank you for such quick delivery and excellent communication! It's much appreciated, and we really like the piece...” See our Modern Danish Long Entertainment Unit, to order yours today. From Michelle of Toowong, QLD (Australia) regarding the Modern Danish Bedside Table she purchased. “...The unit was delivered on Friday afternoon - amazing piece of furniture. It looks perfect in our living area under our wall mounted TV. Thanks you so much for your speedy delivery!...” See our Modern Danish Bedside Table, to order yours today. From Marina of Tennyson, QLD (Australia) regarding the Industrial Recycled Coffee Table she purchased for a client. “...Thanks for the delivery today, first thing this morning! Client is over the moon with the coffee table and so am I. It was beautifully packed!...” See our Industrial Recycled Coffee Table, to order yours today. From Nicholas of Prahran, SA (Australia) regarding the Modern Danish Long Entertainment Unit he purchased. “...A BIG thank you for all that you have done for me in regards to my order & the delivery of the item. I have purchased quite a few items/products online but never with the sort of support & care to which you provided throughout the process. I will be telling all about the amazing experience I had from your site and be assured I will return in the future for other purchases. So thank you again, till next time...” See our Modern Danish Long Entertainment Unit, to order your today. From Jordan of Williamstown, VIC (Australia) regarding his purchases from GHIFY. "...Thanks so much for your help, you have been outstanding!..." See our items at GHIFY, to order yours today. From Sharna of Mile End, SA (Australia) regarding the Modern Danish Long Entertainment Unit she purchased. “...I received the delivery on Thursday! My partner and I are very happy with the product, which has made an excellent addition to our lounge room. It complements our oak Hans Wegner lounge beautifully and the quality of craftsmanship is outstanding. Even the drawers were designed in a way that retained the feel of an original vintage piece...” See our Modern Danish Long Entertainment Unit, to order yours today. From Alice & Michael of Hope Island, Queensland regarding the furniture from the Modern Danish range they purchased. "...We think you not only sell quality products but your service is excellent. That will keep the customers coming & repeat business too, like us. People remember good service & they never forget bad so stick to your current model & you should do well. Will has excellent communication skills & patiently let us look around the work shop on our visit. His 'one offs' are fabulous. He is obviously very skilled in what he does; a real craftsman. You must be very proud of him. Michael was HUGELY impressed with the dovetails and gas hinges! Together you make a great team. They will bring us much pleasure, we are so glad we found your site ...” See our Modern Danish range, to order yours today. From Michael of Adelaide (Australia) regarding the Industrial Recycled 3 Drawer Entertainment Unit he purchased. "...Thanks for that! Being in sales myself I thought you may find this interesting. I actually found this unit in a store in Adelaide for about $300.00 more and did not get any service in the shop (there loss I guess!!) so jumped on line and found you guys! So far for your updates and feedback has been awesome and the process very easy. Keep up the good work! Seems on line shopping is the future!..." See our Industrial Recycled 3 Drawer Entertainment Unit, to order yours today. From Jason of West End, QLD (Australia) regarding the Modern Danish Solid Timber Armchairs he purchased. “...Will's furniture is wonderful and we are very happy to be having two pieces in our home and so quickly. Thank you both. The chairs arrived in less than 24 hours and are now proudly in our living room. They have thumbs up from our ‘other baby’ Huxley!..." See our Modern Danish Solid Timber Armchairs, to order yours today. From Michelle of South West Rocks, NSW (Australia) regarding the Plantation Home Dining Chairs she purchased. “...Just letting you know, that we are so pleased with the chairs and can’t believe that we received them within 2 days of placing our order! It was quicker than if we had bought from a local shop!..." From Maral of Sydney, New South Wales (Australia) regarding the French Chic Classic Provincial Dining Table and the French Chic French Dining Chairs in Crème they purchased. "...We very much appreciate your kind service and we'll certainly think of you in future and pass your details on when relevant, I don't think we'll forget the name!!..." See our French Chic Collection, to order yours today. From Heather of Ashgrove, QLD (Australia) regarding the Modern Danish Furniture she purchased. “...Order arrived. I love, love, love it. I'm especially delighted with the nest of tables. I feel like I've returned to my childhood! Really Pleased! The furniture is Lovely. I was looking for something plain and not enormous. It is beautiful and fits the bill perfectly. I will certainly be raising a toast to you and Will. Gorgeous furniture, spectacular service. It really has been a pleasure...” See our Modern Danish Furniture, to order yours today. From Karen of Perth, Australia regarding the Industrial Recycled Dining Table she purchased. "...Just wanted to you know that we have received the table in an excellent condition! Thank you so much for the arrangement!..." See our Industrial Recycled Dining Table, to order yours today. From Shaun of Elwood, VIC (Australia) regarding the Modern Danish Furniture he purchased. “...Your stuff suits our house perfectly! So glad we found you guys!...” See our Modern Danish Furniture, to order yours today. From Anita of Melbourne (Australia) regarding the Modern Danish 1 Door Entertainment Media Unit she purchased. "... A very quick note to say that my unit arrived yesterday, very safe and sound (what fantastic packaging!) and I love it!! It is beautifully made and incredibly good value. Thank you so much..." See our Modern Danish 1 Door Entertainment Unit, to order yours today. From Michael of Pyrmont (Australia) regarding the Eco Recycled Stool he purchased. "... Hi Will and Maddy, Just a quick note to let you know that I received my stool today when I got in to work, thank you so much, it looks great. Just thought I would send you through a picture so you can see how it looks. Thanks again. Really appreciate it..." See our Eco Recycled Stool, to order yours today. From Martine Brinsdon Optometrist of Murwillumbah, New South Wales regarding the 'Once Upon A Queenslander' Sideboard/Entertainment Unit & Console/Dressing Table they purchased. "...@GhifyDotCom... and we love it too. The cabinets and table are such a hit. So many people have said so many good things. #stunning..." See our 'Once Upon A Queenslander' Table Collection, to order yours today. From Kitty of Ivanhoe, VIC (Australia) regarding the Modern Danish Angle Dining Chairs and Modern Danish Large Angle Rectangle Dining Table she purchased. “...Thanks Magdalene and team! I am loving my table and chairs. Quality, workmanship of your products and customer service are all top class. Even the packaging is carefully considered and done, very impressive!!! It is a very pleasant and wonderful online purchase experience. Your layby option makes owning more of your products possible too. You will definitely see me again!...” See our Modern Danish Collection, to order yours today. From F.M. of Waterloo, New South Wales regarding the Modern Danish Long Entertainment Unit they purchased. "...Thank you for the quick delivery of our media unit - it's gorgeous! Really happy with it, Thanks again. :) ..." See our Modern Danish Long Entertainment Unit, to order yours today. From J.V. of Willetton, Western Australia regarding the Modern Danish 7PC Suite they purchased. "...We are utterly amazed at how well everything was packed (your team should be commended) and the suite is exactly what we were hoping for..." See our Modern Danish Dining Suite, to order yours today. From Helena Van Every of Brisbane, Queensland regarding the Modern Danish Medium Angle Dining Table and Modern Danish Medium Sideboard she purchased. "...Hi Guys! My new dining room table and sideboard was delivered this morning (Thanks James for the wonderful job you did) and I'm loving it sick!! Thanks Will and Magdalene for such beautiful items and customer service...Helena..." See our Modern Danish Medium Angle Dining Table, to order yours today. From M.H. of Singapore regarding their custom made order of the 'Once Upon A Queenslander' Eco Recycled Bedside Table they purchased. "...Hey Maddy & Will, I think it looks absolutely stunning! Thank you so much. Love the colour and the sanding to show some of the timber, looks perfect and I'm really loving it. The handy small size and finish are great! :) Thanks again for your help with this and your fantastic creation!!..." See our 'Once Upon A Queenslander' Eco Recycled Bedside Table, to order yours today. From N & M of Willoughby, New South Wales regarding the Eco Recycled Cabinet/Sideboard they purchased. "...The cabinet was delivered today and we are absolutely thrilled with the end result. It's exactly what we wanted, we are so happy. It's been a pleasure working with you. We will definitely come to you if we need anything made in the future and will recommend you to our friends...." See our Eco Recycled Cabinet/Sideboard, to order yours today. 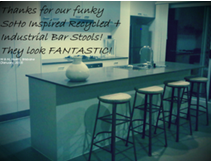 From W & M of Manly, Brisbane, Queensland regarding the Industrial Recycled SoHo Inspired Bar Stools they purchased. "...Thanks for our funky SoHo Inspired Bar Stools! They look FANTASTIC!..." From M.T. of West End, Queensland regarding the 'Once Upon A Queenslander' Eco Bar Stools they purchased. "...Thanks so much, we love the stools, they were an absolute hit, also the personal touch both on the stools and in terms of the service you have given has been first rate. More than happy to recommend you to friends, and have already done so, thanks again..."
From J.G. of Port Douglas, Queensland regarding the Nautical Sextant Collectible, they purchased. "...I have received the Sextant, it is awesome. Thank you!!! Love your work!..." See our Nautical Sextant Collectible, to order yours today. From C & E of Teneriffe, Queensland regarding the Eco Recycled High Bench Table they purchased. "...High Bench Table arrived yesterday. Looks a million dollars..." See our Eco Recycled High Bench Table, to order yours today. From Martin & Kathi of Brisbane, Queensland regarding the Recycled Large Square Mirror, they purchased. "...Hi, I want to let you know how happy we are with the GHIFY mirror we found online. It is perfect. Thank you so much for the excellent and efficient service...."
From JDC of Bulleen, Victoria regarding the Modern Danish Coat/Hat Rack, they purchased. "...The hat rack LOOKS GREAT!!!...." See Our Modern Danish Coat/Hat Rack, to order yours today. From Charlie of Morningside, Queensland regarding the Industrial Recycled Hall Table, they purchased. "...Just wanted to let you know how much I love the table, it looks amazing!..." From Penny of Yaapeet, Victoria regarding the Shabby Chic Kitchen/Bar Stools, they purchased. "...Hi, I just wanted to let you know that I received my stools today and I am so happy with them, I can't thank you enough for all your help with the shipping costs and follow up courtesy emails. You have been a pleasure to deal with and the stools are fantastic - just what I've been looking for! Thanks again, Penny...." See our Shabby Chic Kitchen / Bar Stools, to order yours today. From DW of Perth, Western Australia regarding the Modern Danish Furniture they purchased. "...Fabulous furniture that's bang on trend and won't break the bank, together with top grade customer service makes for smart buying. Love my GHIFY!..." See our Modern Danish Furniture Collection, to order yours today. From Jane of Bentleigh East, Victoria regarding the Modern Cottage Hall Table she purchased. "...Hi Maddy, Thank you, I received the hall table today. It was a house-warming present for my son and daughter-in-law's new apartment. It fits perfectly and they are very happy with it. Thank you for your excellent service and concern. Cheers, Jane..." See our Modern Cottage Hall Table, to order yours today. From Julia of Margate, Queensland regarding the Shabby Chic Square Mirror she purchased. "...Fantastic mirror. Such a great style for Queenslander homes - and I'm sure for many other character houses! Very friendly, helpful service and quick delivery too. Highly recommended!..." See our Shabby Chic Square Mirror, to order yours today.